Greensboro, NC : Morgan Reynolds Publishing, 2012. 110 p. : illus. : 23 cm. In the 600s CE in Arabia, a simple merchant named Muhammad told his family and friends that he had been visited by an angel from God. That divine messenger told him that he was a prophet who had been chosen to recieve and to preach a series of truths about the world and humanity. According to Muhammad, the angel then recited to him what became known as the Qur&apos;an, which became the holy book of a new faith- Islam. 100 ME:PersonalName 1_ $a Personal name Nardo, Don. 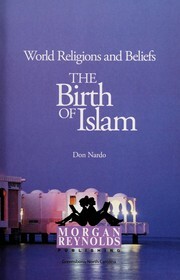 245 Title 14 $a Title The birth of Islam. 250 Edition __ $a Edition statement 1st. 300 Physical Desc __ $a Extent 110 p. : illus. : 23 cm. 500 General Note __ $a General note Includes bibliographical references. 520 Summary __ $a Summary, etc. note In the 600s CE in Arabia, a simple merchant named Muhammad told his family and friends that he had been visited by an angel from God. That divine messenger told him that he was a prophet who had been chosen to recieve and to preach a series of truths about the world and humanity. According to Muhammad, the angel then recited to him what became known as the Qur&apos;an, which became the holy book of a new faith- Islam. 541 Acq Source Note __ $d Date of acquisition 2011/10/14. 650 Subj:Topic __ $a Topical term Islamic Empire--History--Juvenile literature.